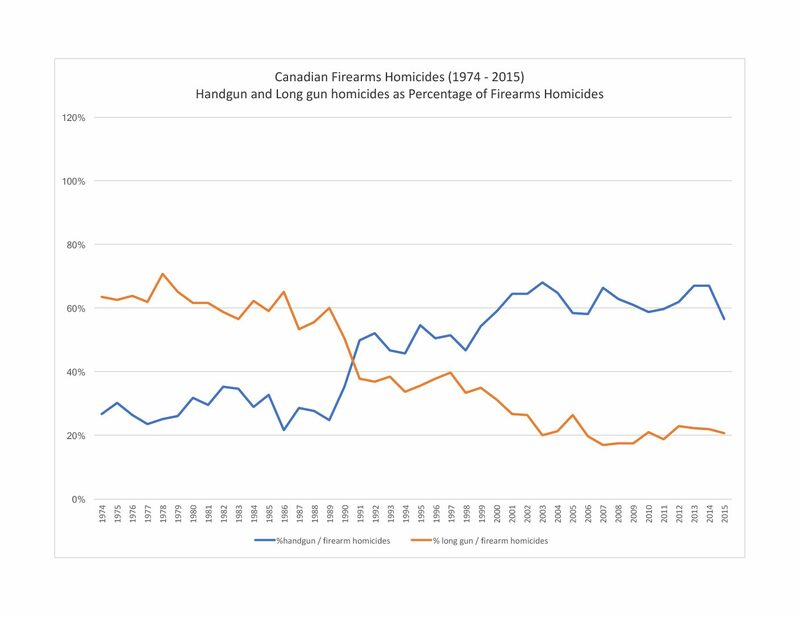 Recent Canadian homicide trends undermine claims of anti-gun activists. Just 10% of homicides involve spousal victims, and guns are not the typical weapon used. Knives are used in one-third (32%) of spousal murders, with firearms used somewhat less often (28%) according to a Special request I submitted to StatsCan a few years ago. Claims that the public can’t be trusted to have guns are based on false assumptions. There is no empirical support for suspecting firearms owners to be more likely to commit domestic violence than any other Canadian. Most spousal murderers have a police record and thus they cannot legally acquire or even possess a gun. Just one-percent of the firearms used in spousal homicide had ever been registered, and only 2% of the killers possessed their firearm legally. Spousal murderers are not normal people. 63% of spousal homicides stem from a history of prior abuse. Two-thirds of adults accused of homicide were known to have a Canadian criminal record; the majority of these had been previously convicted of violent offences. Multiple-victim murders dominate the news, but due to their rarity — in both Canada and the United States — they are not useful for understanding criminal violence or for designing gun control policies. Nevertheless, spree killings are great for media to attract viewers — and for politicians to posture. Spree killings — with firearms or other weapons — are rare. Based on a special request I made to Statistics Canada, there were between two and three incidents of murders with multiple-victims (more than 4 victims) per year in Canada from 1974 to 2010. This is about four percent of all murders. Despite claims to the contrary, they are rare in the United States as well. Between 1974 and 2011, there were around 25 multiple murders-victim per year in the US: just two percent of all murders. Gang murders are the major problem facing the authorities. And they are increasing. Despite increasingly rigorous firearms restrictions, gang murders increased from under 10% of all homicides in 1999 to 24 % in 2016. This is the statistical backdrop for the recent report on “Guns and Gangs” by British Columbia authorities. 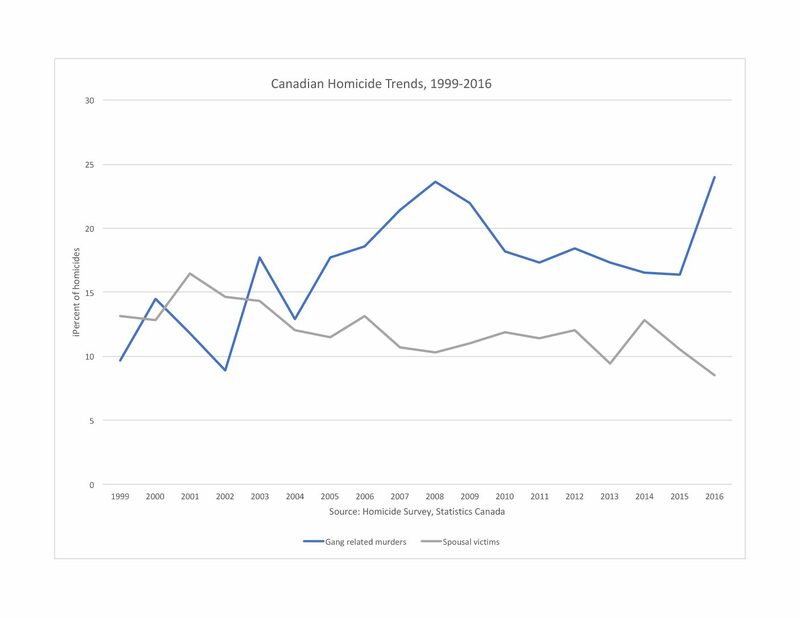 Be the first to comment on "Canadian homicide trends"